Traditional Styling And A Rich Mahogany Finish Make This Curio Cabinet Perfect For Any Room In Your Home. Matching Shoe And Crown Molding Enclose The Cabinet While Glass Paned Doors And Side Panels Draw Your Eyes To All Of Your Wonderful Collectibles. The Inside Of The Cabinet Has A Large Mirror Back That Visually Adds Depth While The Clear Fixed Glass Shelf Divides The Space In Half, Making Room For A Wide Variety Of Items. 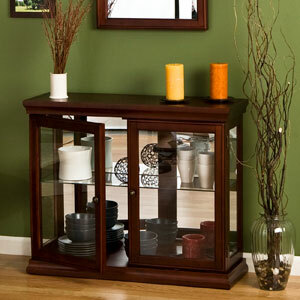 This Gorgeous Curio Cabinet Is Perfect In The Dining Room, Entryway Or Living Room. Strong Construction. Easy To Assemble.